Grammatica sanscrita / di Giovanni Flechia. - Torino : Giacinto Marietti, 1856. 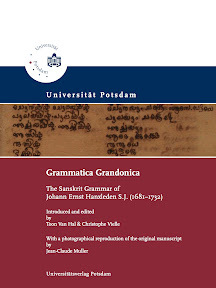 - , 408 S.
Grammatica Grandonica : the Sanskrit Grammar of Johann Ernst Hanxleden S.J. (1681-1732) / introduced and ed. by Toon Van Hal & Christophe Vielle. With a photographical reproduction of the original manuscript by Jean-Claude Muller. - Potsdam : Universitätsverlag Potsdam, 2013. 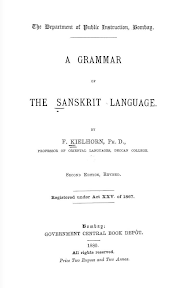 - 280 S. : Ill.
A Grammar of the Sanskrit Language / by F. Kielhorn. - 2nd ed., revised. - Bombay : Government Central Book Depôt, 1880. 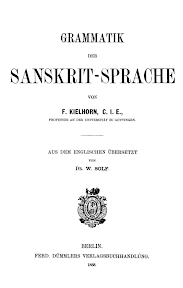 - xiv, 266 S.
Grammatik der Sanskrit-Sprache / Franz Kielhorn. Aus dem Engl. übers. von W. Solf. - Berlin : Dümmler, 1888. - XIII, 238 S.
Issues in the Placement of Enclitic Personal Pronouns in the Rigveda / by Mark Raymund Wenthe. - Athens, Ga., 2012. - vii, 239 S. : Ill.
Tense and aspect in the Vetālapañcaviṅśati : a work of late classical Sanskrit / by Sarah Ransom Rose. - St. John's, Newfoundland, 1997. - viii, 120 S.
A grammar of the Telugu language / by Charles Philip Brown. - 2nd ed., much enlarged and improved. - Madras : Christian Knowledge Society's Press, 1857. - vii, , ix-xii, , 363 S.
A Grammar of the Teloogoo language : commonly termed the Gentoo, peculiar to the Hindoos inhabiting the North Eastern Provinces of the Indian Peninsula / by A. D. Campbell. - 3rd ed. - Madras : Hindu Press, 1849. - xxi, 202, 18 S.
A Grammar of the Teloogoo language : commonly termed the Gentoo, peculiar to the Hindoos inhabiting the North Eastern Provinces of the Indian Peninsula / by A. D. Campbell. - 2nd ed. - Madras : College Press, 1829. - xxi, 202, 18 S.
A Grammar of the Teloogoo language : commonly termed the Gentoo, peculiar to the Hindoos inhabiting the North Eastern Provinces of the Indian Peninsula / by A. D. Campbell. - Madras : College Press, 1816. - xxv, 208, 19 S.